Recently, in the 1990's as well as since the turn of the millennium the Central and Provincial Governments have invested massively in large scale infra-structure projects. A Nationwide highway network has largely been completed, connecting every Provincial Capital as well as every district or county Town in the Peoples Republic. For travel specific information on each highway and road connection please go to the main menu of each individual Province, Autonomous Region or Territory for up to date information and Maps. The most elaborately described provinces even feature special dedicated chapters on the various modes of Transport within the Region, describing the most important highways, provincial roads and tourist preferred routes of Travel. Passenger seats on Chinese trains are divided into four different classes: hard seats and soft seats, and further hard sleepers, soft sleepers. The newly introduced high-speed trains range in a class of their own and are the most expensive and most luxury rides in the Nation. In addition, on number of shorter local tracks near large Coastal Cities dubbel-decker trains with soft seats and air-conditioned passenger spaces are in service. These represent the latest and future generations in Chinese trains and train travel. Due to recent upgrades of railway tracks, the currently ongoing introduction of a high speed railway network throughout the nation, and the construction of a multitude of new lines in every province and region has changed the time-schedules for train travel within the nation dramatically. At the moment trains are increasingly competitive with air-travel within the Peoples Republic. This situation is only expected to improve. Below is a short introduction to the various modes of Public Transportation within the Peoples Republic of China. Information is kept updated where possible as China goes through an unprecedented construction period including large scale additions to- and modernizations of its Public Transportation infrastructure Nationwide. Apart from the above General Information on Public Transportation in China, a number of dedicated Chapters are available on Public Transport in specific Chinese Provinces, Regions or Cities. Please refer to the below list for full information on each. Although China knows only a relatively short history as a Railway Nation, just over one century, this does not mean that Chinese People make less use of trains or that China knows no thrilling train rides to speak of. On the contrary, the traditional mode of mass transport over long distances has been the train and today China is a railway Nation with many exciting, interesting and unusual tracks and railways. Several recently established lines, among which the 'Tibet Express' and China's new and modern 'home made' bullet trains, have only added to the wide variety of experiences to be had. A growing number of Railway experiences in China is described in more detail inside China Report. Please browse the below list and select a Journey. Click through for more information, photos and video. 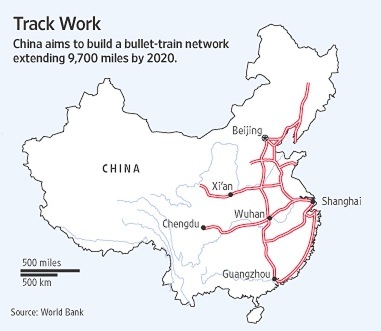 Projected high speed train connections in China in 2020. A large part of the railway network is already in operation, such as the Beijing-Guangzhou Line and the Beijing Shanghai Line.